Get ready for Fanalytics at TC18! It's that time of year again! Tableau Conference is around the corner, attendees are starting to plan their week, and we want to make sure Fanalytics is on your radar! 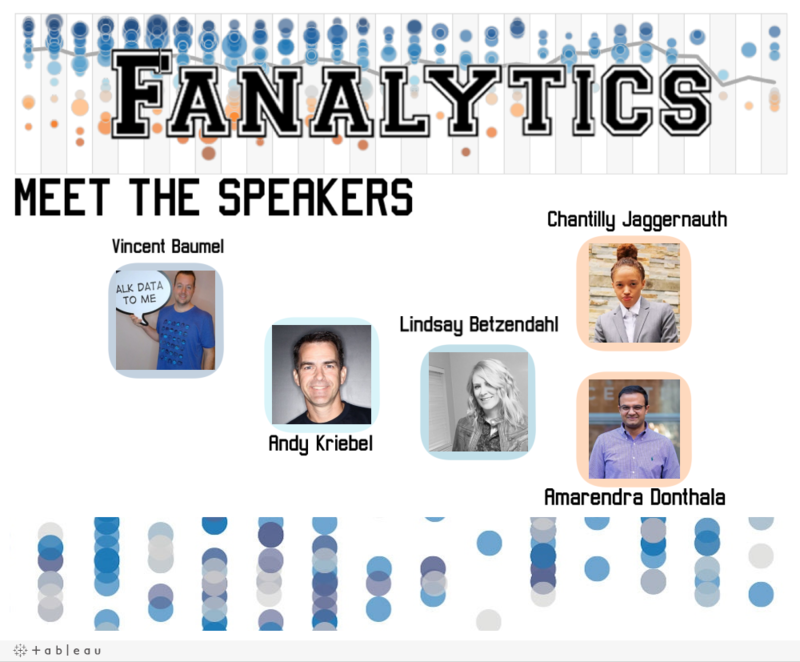 If you are new to the Tableau Community, Fanalytics is a fun and inspiring event where the community gathers to discuss data visualization, community initiatives and all things Tableau Public. You may have spotted it on the conference's agenda overview: this year, Fanalytics will take place on Thursday, October 25 between 2:15 PM and 5:15 PM. Note that we made it slightly earlier than in past years, meaning Fanalytics will start at the same time as the last breakout sessions. But by changing the time, now everyone can join and enjoy a last drink before going home! What's on the agenda this year? An inspiring lineup of presentations by authors from the community, followed by breakout sessions where attendees will gather into smaller groups to discuss topics dear to their hearts. We are extremely happy to welcome the five speakers below, who will share the stories behind their recent personal and community initiatives. If you have always wondered how big projects are born, these presentations should quench your curiosity and help you start your own data-related initiative. Building up on the high energy conveyed by the speakers, we will then split into small groups to discuss hot topics in the community. Here, you will have a chance to exchange with other passionate members of the community on important topics such as gender equity or Iron Viz. Each topic and associated guiding questions will be briefly introduced by our wonderful MC, the famous Jonni Walker, before everyone grabs a drink and joins the conversation. Newcomers, fear not! We also have mini-workshops planned so you can learn new skills that will help you kick-off your Tableau Public profile (before you join the conversation next year!). This year, we've curated six table topics sure to prompt lively discussion. Take a quick scan below, or dive into the context and conversation starters for each topic! Making Tableau Public Better: share your feedback and ideas with our team of Tableau Public developers. Building Gender Equity: brainstorm how we can continue to recognize talented women in the community. Being Open to Newcomers: question what it means to be a newcomer and determine ways we all can be more inclusive. Reviewing Iron Viz: review changes we've made since last year’s competition and share ideas for how we can continue improving. Promoting a Data Culture in your Organization: discuss what a “data culture” looks like in the wild and how you can help spread it. Finding Tableau Mentors: explore what mentorship looks like in the community and how you can get involved. Now, before you go back to add Fanalytics to your conference agenda, would you like to play a part in this event? If so - well first, thank you! - you can express your interest in the Google Survey below. Among the attendees, we are looking for volunteers from the community to coordinate discussions (Topic Leaders) and support mini-workshops (Workshop Facilitators). On top of getting the chance to meet a bunch of new people, being a Topic Leader or Workshop Facilitator will also guarantee you a spot at Fanalytics, otherwise a first come, first served session. The Tableau Public team is looking forward to seeing as many of you as possible at Fanalytics!